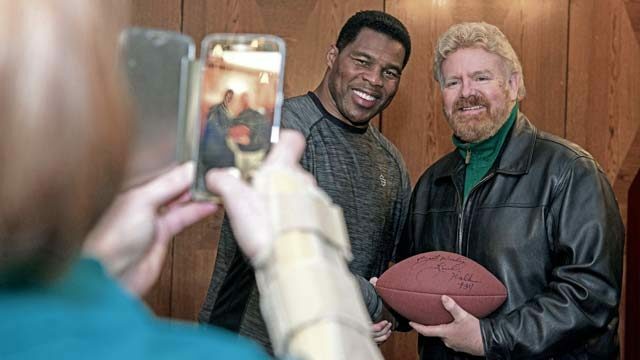 Herschel Walker has a photo taken with a Team Ramstein member at the Officer’s Club on Ramstein Air Base, Jan. 9. Walker visited the Kaiserslautern Military Community to share his struggles and successes with his mental health while encouraging those he met to seek out help if they need it. Heisman Trophy winner, former NFL player, U.S. Olympian, and Mixed Martial Artist Herschel Walker came to the Kaiserslautern Military Community Jan. 9-10, to visit with KMC members and share his struggles with mental health. Herschel’s story focused on his discovery that he suffered from Dissociative Identity Disorder. Herschel credits the day he went to a behavioral health hospital as the best thing that ever happened to him. He encouraged those at a town hall he hosted to seek the help they need. “Everyone knows the glory of Herschel Walker, but not everyone knows the story,” he told a group of KMC members. Herschel suffered from physical and emotional childhood trauma at the hands of his peers. He was consistently taunted and beaten up because he was overweight and suffered from a debilitating stutter. Finally, in eighth grade he had enough. He began working out every day. He read out loud to himself in front of his mirror to correct his stutter. He made himself sit up front and participate in class. He got stronger. He became more confident. His grades went up, his social standing improved and years later he became the all-around consensus for the greatest college football running back of all time, according to the National Football Foundation. But that growth triggered something else. Herschel then recalled the day he discovered that dark and painful side of himself. This was the moment when Herschel knew he needed to get help. He worked with his ex-wife, his pastor, and his doctor to find a hospital that could help him on his road through recovery. He checked himself into a hospital in California and began treatment. Herschel learned how to deal and cope with his mental illness through counseling and group therapy sessions, he said. Herschel encouraged attendees to not be ashamed of seeking help for mental illness. In addition to hosting a town hall, Herschel also conducted two meet and greets and an open workout session at the North Side Gym on Ramstein. During this session he led a group of KMC members in one of the workouts he has used since high school. The 86th Airlift Wing has several options for KMC members to seek help with mental illness. Chaplains assigned to the wing can be reached at: 06371-47-6168. The 86th Medical Group offers mental health counseling, their phone number is: 06371-46-2273.